Originally, the Japanese term Samurai described those in the service of either nobility or wealth. Today’s Nice Price or Crack Pipe Suzuki pickup is ready to serve, but will it have you saying - in true Dr. Seuss fashion - I do not like a price so high, Samurai? The Samurai name was given to those who perhaps served these Taikun, eventually distilling to mean the warriors who acted as their protectorate. It’s a little funny then that Suzuki would apply so esteemed a title to a car of so limited capabilities, but hey, go big or go home, right? Of course establishing a beachhead in the ultra competitive U.S. Market was pretty ambitious, so perhaps the name was fitting. When the Samurai did arrive here as a 1986 model, it came with the choice of closed three-door or basket handle open-top models. What we didn’t get was the cool little pickup truck version, of which today’s contender is a 1982 edition. 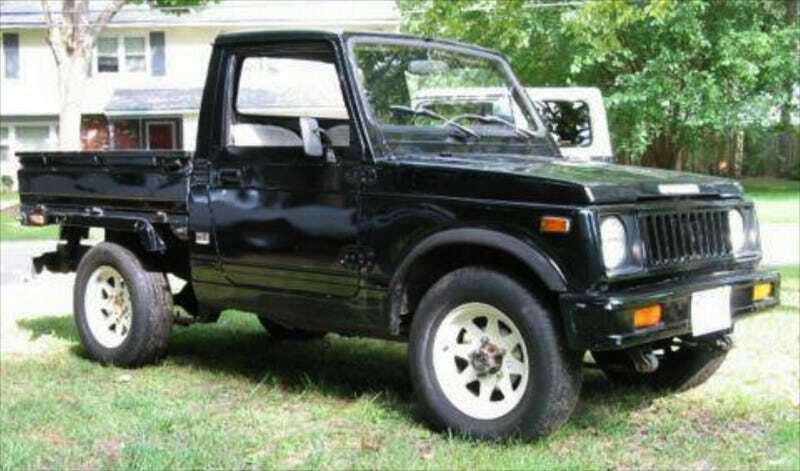 The SJ410K, having never officially been sold in America is obviously not an official Samurai, but still, from the doors forward it looks the same so it’s just easier to identify it as a Samurai pickup. Plus, how cool is that? The seller notes that this is one of about 15 of the trucklets currently in the States, and while I couldn’t tell you how accurate a number that is, I’d guess that he might know what he's talking about as he appears to own two of them. He’s also pretty active on Zuharrie so you get the idea that the seller is really into, and hence knows, his Samurais. This being an ’82 and a non-Federalized model, means that it rocks the 970-cc 45-bhp four, and drum brakes all the way around. Top speed with this engine is a scintillating 68 mph so those drums shouldn't too overly taxed. The tiny truck also has a 4-speed stick-it-to-me, as well as leaf sprung live axles on both ends under a sturdy ladder frame. Hemorrhoid suffers thus likely need not apply. This one is in black over white steel wheels of the sort Suzuki preferred for the Samurai, and which are also the rim of choice for a lot of trailer makers. The bed sits atop the frame with very short sidewalls making capacity somewhat limited, but with a box unencumbered by wheel well intrusion. Also, it’s about as cute a utility as you could imagine. On the downside, the seller notes that this SJ has been sitting for a while and comes with a litany of issues that probably need to be addressed before attempting to turn it into a reliable daily driver. There are brake issues as well as electrical gremlins that need to be taken care of, and then there's the engine which he says runs but needs its carb to be smacked around a little to ensure it gets with the program. The scariest issue however is the noted need of new floorboards welded in, to repalce their rusted predecessors. That is, unless your name is Fred Flintstone. 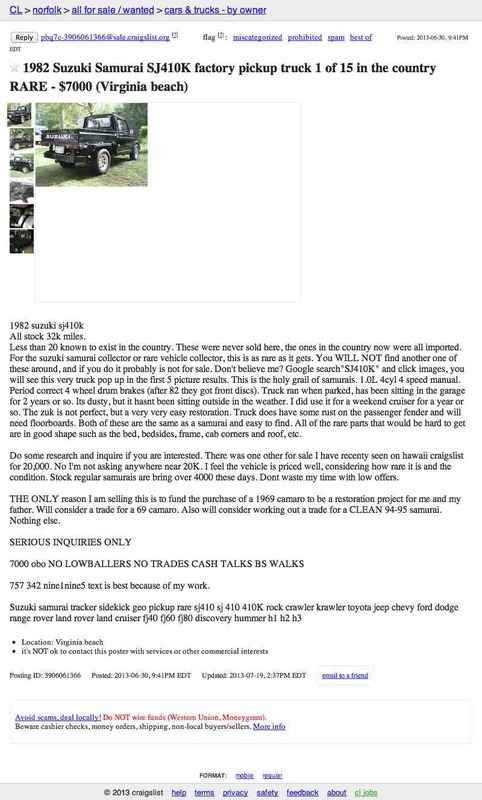 This Samurai pickup has been for sale for a while now, and the current Craigslist ad has it going for $7,000 or a ’69 Camaro - and kudos to the seller for being from Virginia and spelling Camaro correctly, you’re alright dude. What do you think about he chances of moving this SJ for his $7,000 asking price? Does that make this a pickup that somebody will be quick to snap up? Or, is that a price that makes you say no-way SJ? A spin of the rev counter to Marshall for the tip!